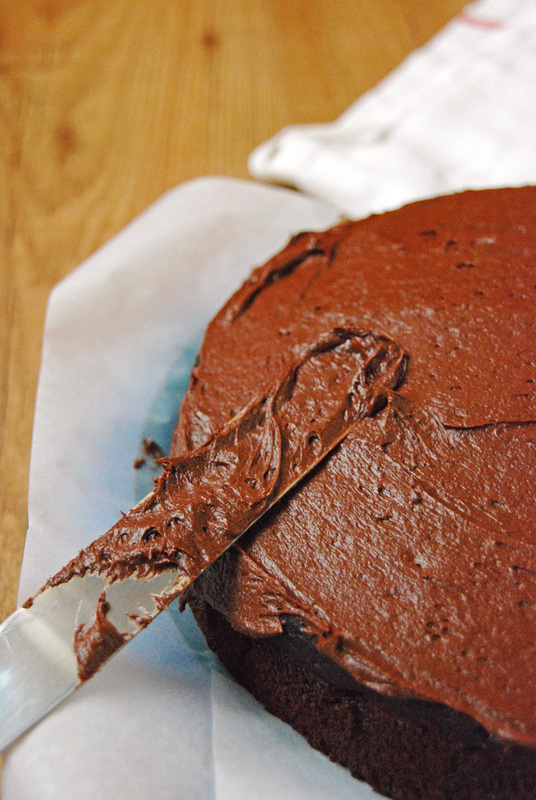 Chocolate Beet Cake? Yes! 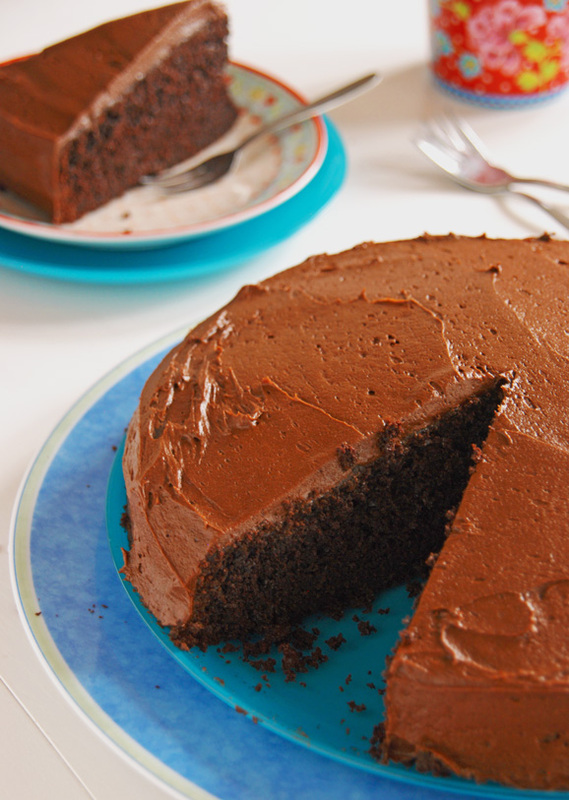 Chocolate BEET Cake! 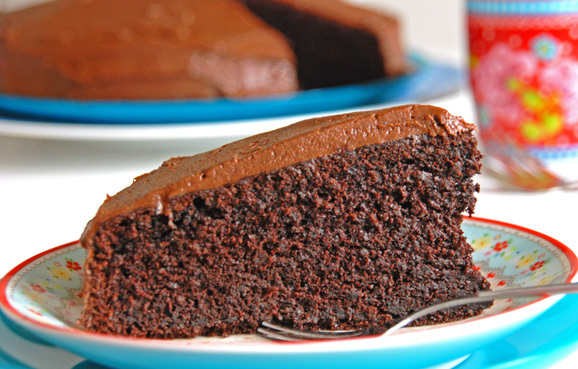 Now, I can almost hear you think: ‘veggies in cake again? Again? !’ Well, yes… I couldn’t resist! So too bad for anyone out there who doesn’t like beets, because I sure love ’em. Besides, how can anyone not love beets? They smell like sand, they are deliciously sweet and they make everything they come in contact with – including cutting boards, hands and cake batter – a bright, hot pink! Still not convinced of how fabulous and totally cake-appropriate beets are? Well, take a good, hard look at the picture at the top, because that little (?) piece of cake up there sure looks good! Anyway, enough with the convincing-people-how-fantastic-beets-are, though… On with some news! Remember my little ‘Making Friends’ campaign? Remember I came up with a recipe for Lindsay of Pinch of Yum? The Double Chocolate Muffins with a Salted Chocolate Heart? Well… She send me a very nice e-mail and left me a message in the comment section, telling me the muffins look fantastic! She even used the word ‘wow’! Luckily, I was able to fix it! Me! The girl who doesn’t really know anything about computers or the Internet! I think that’s worth another ‘wow’, don’t you? Anyway, I had meant to post about the best cookies ever today, but the weather was so dramatically grey and blah, that I wouldn’t have been able to take a decent picture if my life depended on it today, so I’ll post about those next time. Luckily, I had already taken these pics yesterday. Originally, I’d planned to post about this beauty this Friday, to introduce the next blogger I’m going to try to make friends with on Sunday. However, since the weather is so bad and since it’s just so easy to explain yourself on a blog, I’m posting about it now, hoping that my trusty readers still remember the nice girl I’m going to tell them (that means you) about when the time comes that I’m actually sending her a recipe. Okay, so I got this recipe from a blog that I’ve only discovered six months ago, called Warm Vanilla Sugar, but which I liked so much I pretty much read through the entire thing in one sitting. (Thesis? Thesis? Which thesis?). Anyway, the blog is run by Katrina, “a biology geek + self taught cook” from Canada who loves Switzerland, crumbles, crisps and cobblers, and running. Although I usually hate don’t like running, she almost inspired me to go train for a marathon myself! Anyway, it was hard to pick one of her recipes to post about, because they all look amazing. 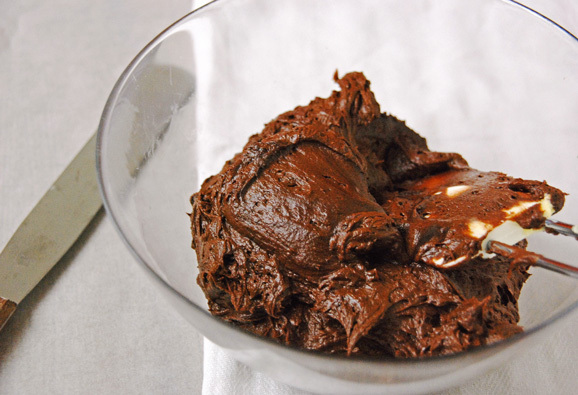 I was really tempted by her recipe for Avocado Chocolate Pudding, but eventually this one won. ‘Cause hey, remember the recipe I used to introduce Lindsay to you guys? 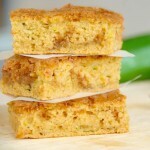 The Cinnamon Sugar Zucchini – yes, zucchini – Coffee Cake? Are you starting to see a pattern, here? Veggies and Cake? So truth be told, I adapted the buttercream recipe a bit. Not only because I didn’t have enough powdered sugar, but also because I thought the original was a little too heavy and buttery. After I added an extra splash of cream, it was a lot… well, creamier! Just look at the stuff! 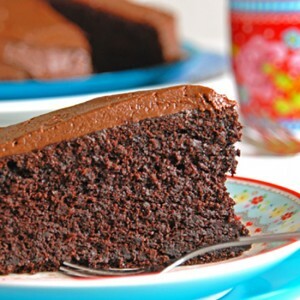 It has a great chocolate taste, gorgeously deep and rich! 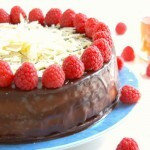 I slathered the sides and top of the cake with it and guess what… Everybody, myself included, absolutely loved it! I’m definitely going to post this under Building Blocks! 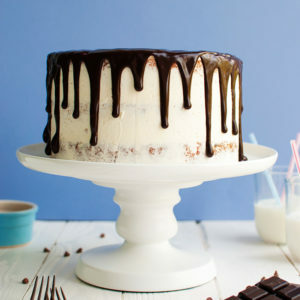 Little tip: place pieces of parchment paper underneath the sides of the cake before you frost it to keep your serving plate from getting all mucky and buttercreamy. Although Katrina says this cake will serve 8-12 people, I’m guessing it could serve close to twenty people if you serve it with a big cup of tea or coffee! This cake is massive. And delicious. And – to the beet haters out there – doesn’t taste of beets at all. And it has beets in it! Veggies! Vitamins! Start by preheating your oven to 175°C or 350°F (standard oven setting). Line a 24-cm (9-inch) round cake pan (I used a springform pan) with baking parchment (use a little butter to stick the parchment to the sides of the pan). Next up, the beet purée. 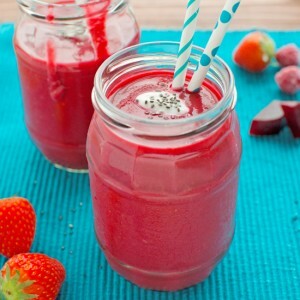 Using a food processor (or a stick blender or a food mill), blitz the beets to a relatively smooth purée. Don't worry if it's still a bit chunky. As long as it looks smoothish, you're good to go. Set the purée aside. In a large bowl, cream together the butter and sugar until the mixture is nice and fluffy. Add the eggs one at a time, mixing well after each addition. Add the vanilla and the beet purée and mix to combine. Whisk together the dry ingredients in a smaller bowl and add them to the beet mixture with the milk. Stir with a rubber spatula until the dry ingredients are almost absorbed by the wet ingredients, then mix briefly with the mixer until smooth and shiny. Pour the batter into the prepared pan and bake for 60 minutes or until a tester inserted into the center of the cake comes out clean. Take the cake out off the oven and leave to cool on a wire rack. 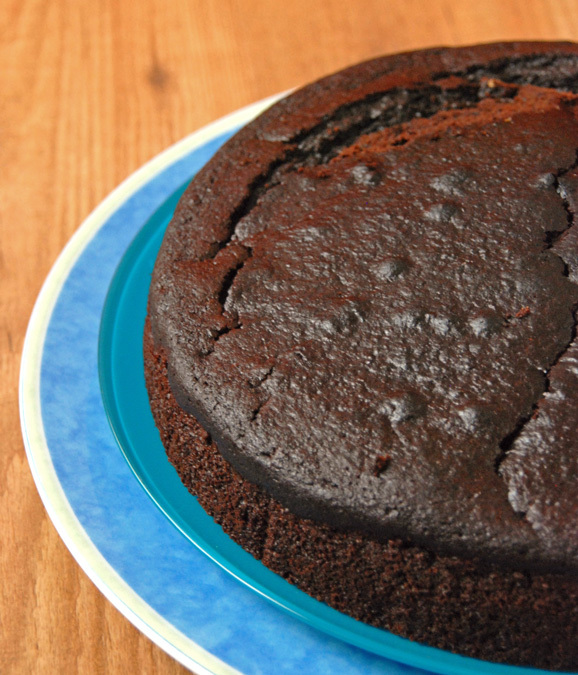 Once completely cooled, take the cake out of the pan and place on a serving plate. 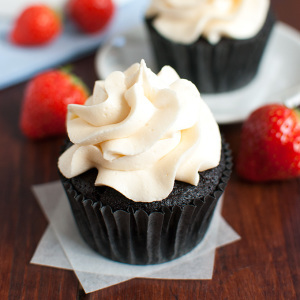 Once the cake is in the oven, prepare your buttercream. 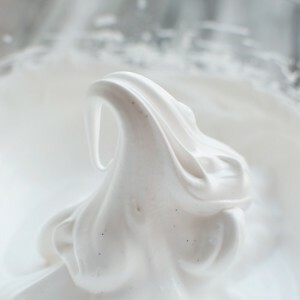 In a medium-sized bowl, mix together all of the buttercream ingredients until smooth and fluffy. I always start mixing with a spoon or spatula,to prevent powdered sugar from flying everywhere once I start mixing. 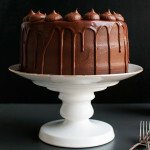 Using a spatula, frost the top and sides of the cake with the buttercream. Serve at room temperature!